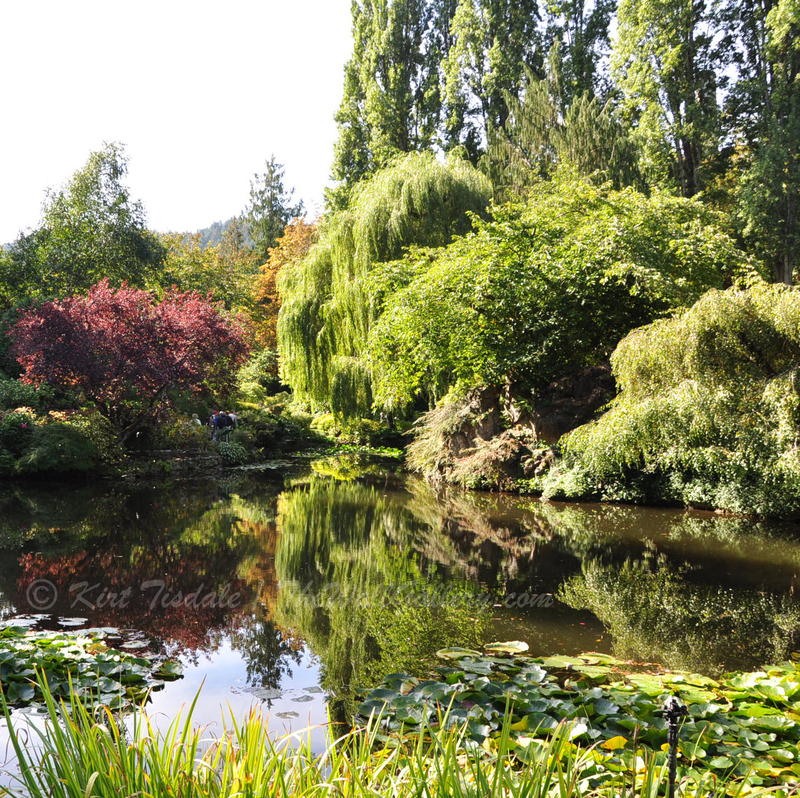 The excerpts from a photo shoot I want to share today are from Butchart Gardens just outside of Victoria, British Columbia on Vancouver Island. My photography doesn’t even begin to do justice to the beauty of these gardens. What started out on the personal estate of the Butchart family and their cement quarry has evolved into a National Historic Site of Canada. I chose this backdrop for today’s example in cropping photographs. Cropping: to cut the edges to produce a better picture or fit a given space. I want to talk today about cropping a photograph to produce a better picture and/or pictures as in the examples. 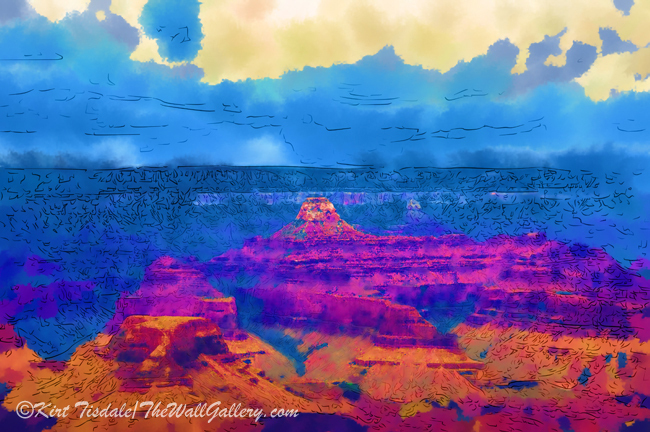 I talked about this awhile ago when I had a client ask me to take a landscape picture I had created and turn it into two portrait prints for their wall (reference my blog: Fountain Urns). A similar theme surfaced this week as I was working on some new art prints for the Gardens Collection. I am constantly renewing and updating the different galleries or collections. As I add new items, I take older ones out and/or re-look and refresh them. I came across some prints that were a few years old and with a fresh eye starting cropping and playing with them. I wasn’t doing anything extreme, just resizing some of the older prints to more standard sizes. In doing that exercise I found myself creating two completely different looks to what was once a single print. To show you the best example, I went back to the original photograph that these prints had been created from. 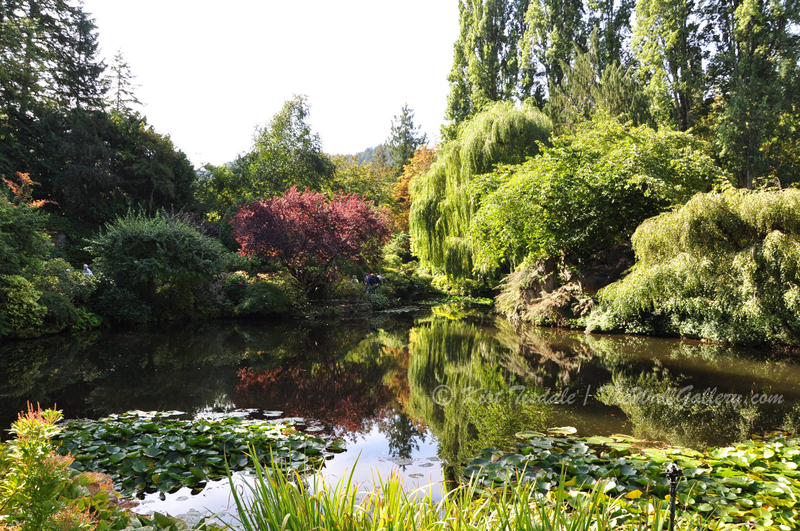 This first shot is the original photograph of a lily pond. If you look closely to the left and center, you can see people walking through the gardens. 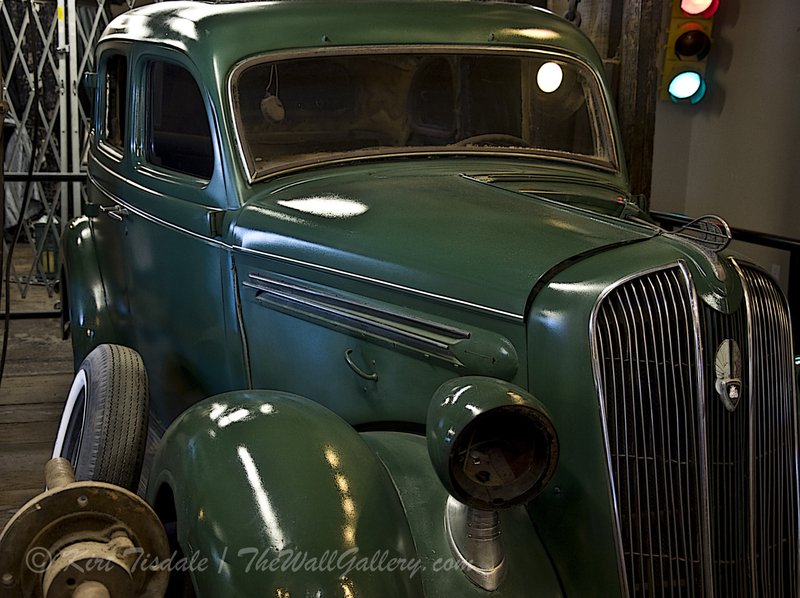 I love this shot and have been fortunate enough to have it featured in a couple of different showings. The different elements of plant life and lighting create a flow across the picture. Let’s dig a little deeper and look at the lighting. The sky is overcast and we have the left half of the frame in shade and the right half in sunlight. Again, the difference makes an interesting picture and pulls your eye across the print. But, what if we just played with it a little bit. In the second picture, I cropped the left portion of the frame into a square. See how it created a different look to the scene? You have the light accenting just the right edge and the foreground. Let’s crop and square the right side, which I did in number three. In this version your photograph is brighter and there is more of a focus on the reflection in the pond. This example of cropping wasn’t about taking a bad picture and making it better, but looking at what you have and what more could you do with it. What elements of a shot change by cropping the picture a little differently? Where does it shift your focus? These are just things to think about as you evaluate your photography. Thoughts? 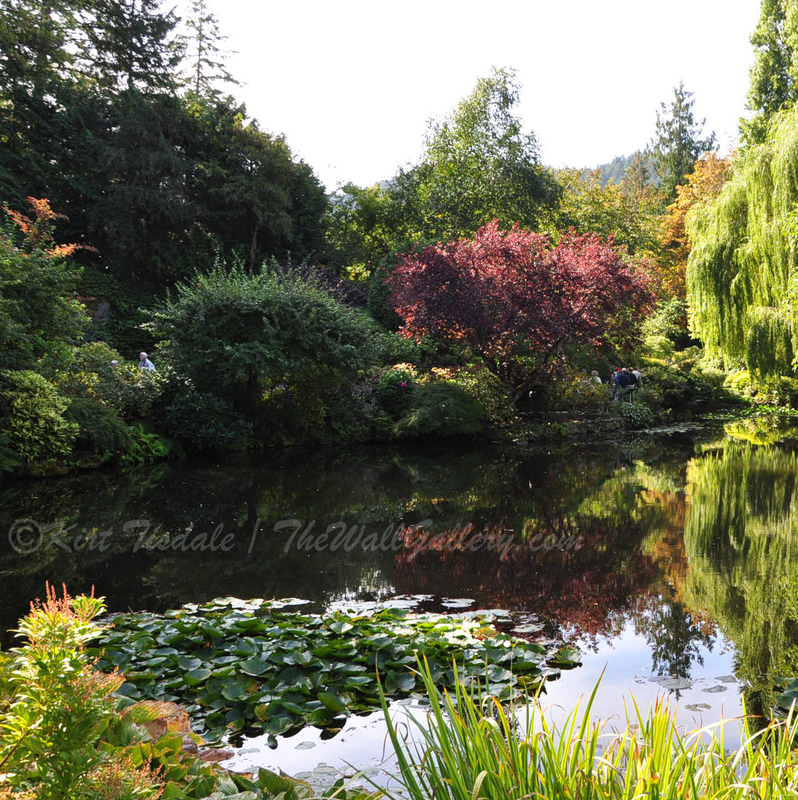 This entry was posted in Color Photography, Photography and tagged butchart gardens, canada, Gardens, kirt tisdale, landscapes, online art gallery, photographer, pond, victoria on August 27, 2014 by Kirt D Tisdale. “Mosby Creek Bridge” is the art print I wanted to feature today from my Architecture Collection. The print is a covered bridge in Oregon. The style I used on this print is a watercolor technique that emphasizes the soft tones of the setting and the weather. The setting is rural with the architectural elements of the bridge reinforcing that image as the road crosses the creek. The weather was intermittent rain with a slight chill to the air as wisps of fog hung around the hills. It’s springtime and the leaves are starting to come out on the trees as the fields are greening up. The entire scene speaks of a quieter, slower pace to life. It beckons one to stop, breath in the fresh air and savor the moment. I confess to having been ignorant on how many covered bridges there are in Oregon. I was enlightened on one of our many road trips from San Diego to Seattle. Our youngest daughter left the family home in San Diego to go to college at the University of Washington in Seattle. Over her four years of school, my wife and I made many trips to the Great Northwest, sometimes flying and sometimes driving all the way through California, Oregon and most of Washington. It was on one of those driving trips through Oregon that I finally clued in on just how many covered bridges there were in that beautiful state. This realization, of course led to spending a few days scouting some of them out. This particular covered bridge, as I’ve stated, is the Mosby Creek Bridge. It was built in 1920 and added to the U.S National Register of Historic Places in 1979. 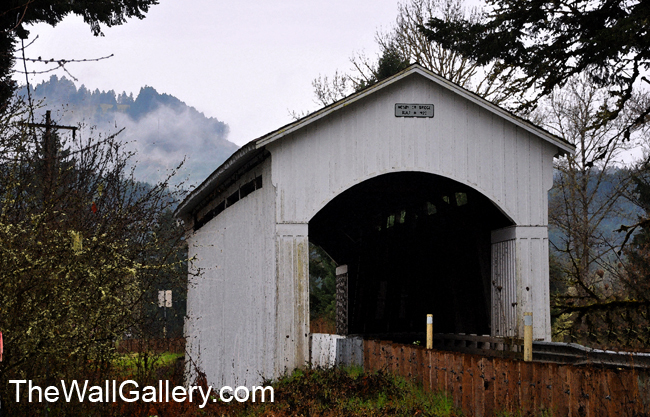 It is the oldest covered bridge in Lane County, Oregon and is still open to traffic. Take a journey back in time and enjoy the print! 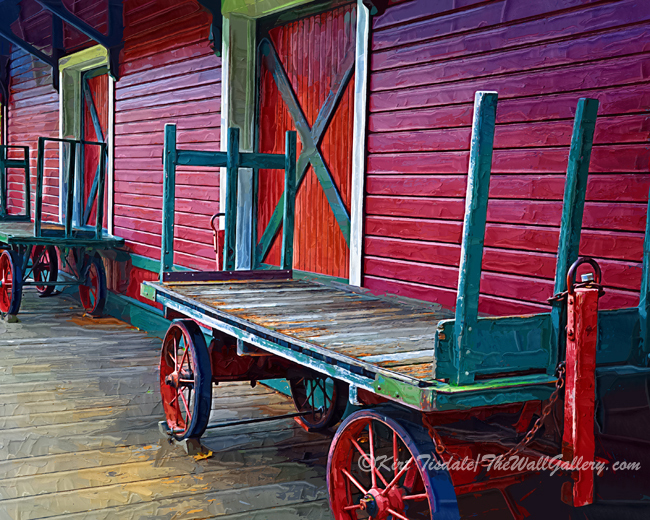 This entry was posted in Art Prints, Landscapes: Watercolor and tagged art gallery, artist kirt tisdale, covered bridges, historic, interior design, online art gallery, oregon, watercolor art on August 25, 2014 by Kirt D Tisdale. “Urban Cluster” is the art print I wanted to feature today from my Cityscapes Collection. 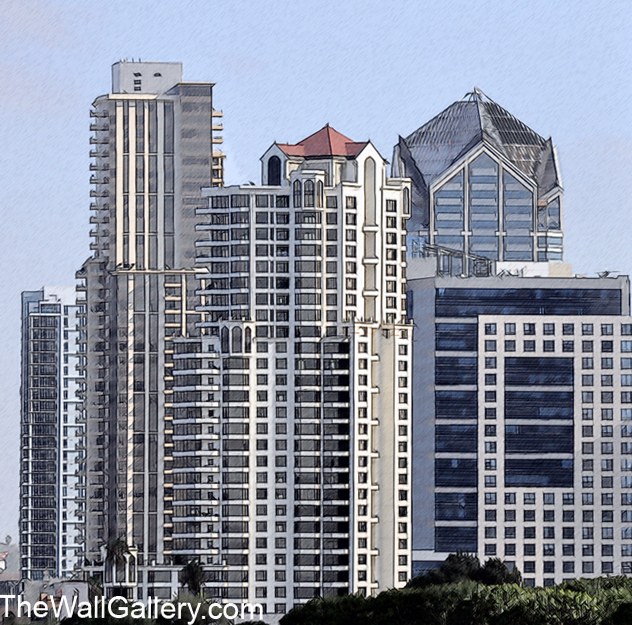 The print is a group of high-rise buildings in downtown San Diego. The style I used on this print is a sketching technique that emphasizes the linear aspect of the group of buildings. This particular print had its birth in a project I was doing for a San Diego based company. I was doing a full day shoot around the core areas of San Diego. My shoot took me along the bay in downtown San Diego, then across the bay on Coronado Island. From Coronado, I used my telephoto lens to shoot the skyline of downtown. In the middle of all of those shots, I found this particular scene. Although I never used it for the project, I was pulled to it seeing some elements I liked. After cropping the shot tighter and squaring it, I found the look I was after. I then played with a technique giving it a sketched appearance with watercolors. I liked the result as it highlights the straight lines and sharp points of the architecture in each of the buildings. It’s a group of five buildings caught at such an angle that they look grouped together. In reality, they are not. The buildings in the forefront are about a block apart from each other and the pointed building in the background is at least a half a mile away along with the high-rise condo on the extreme left. The use of a telephoto lens creates an interesting element in the depth perception as it pulls the background in closer, especially in a tight shot like this. Thoughts? 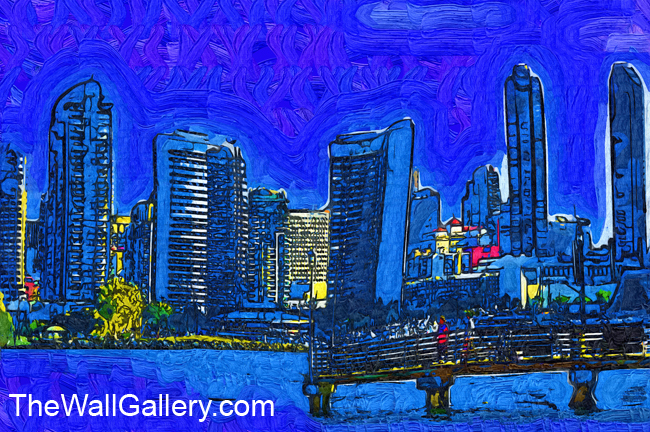 This entry was posted in Art Prints and tagged art, artist kirt tisdale, buildings, downtown, interior design, online art gallery, san diego, urban art prints, Visual Arts on August 22, 2014 by Kirt D Tisdale. The excerpts from a photo shoot I want to share today are from a picnic lunch we had with some friends last weekend. As I always travel with my camera, I was ready for these shots. We had traveled Saturday morning to watch a scrimmage football game by Arizona State University. The facility they have been using is a camp nestled in a pine forest away from campus and the city. With the heat here in Phoenix this time of year this certainly makes more sense for the players. The drive doesn’t take that long and before you know it, you have climbed in elevation, the desert is behind you and pine trees are everywhere. After the scrimmage, we drove further up out of the valley into the mountains and found this spot to eat. The view was incredible, the food and company were great. 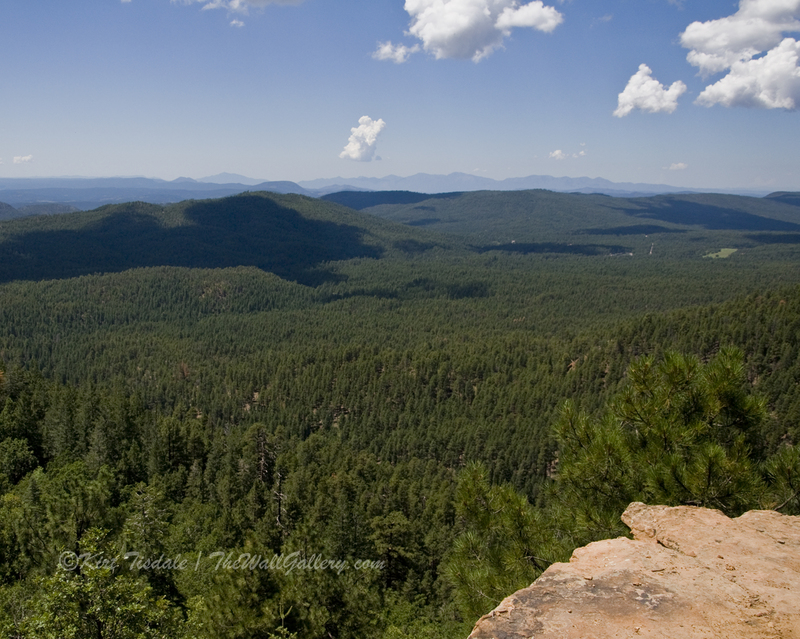 It was nice to just sit and relax in conversation as gentle afternoon breezes blew through the pine trees. This first shot is of the valley where we had just been. The area we had found had a small granite ledge that jutted out over the edge. 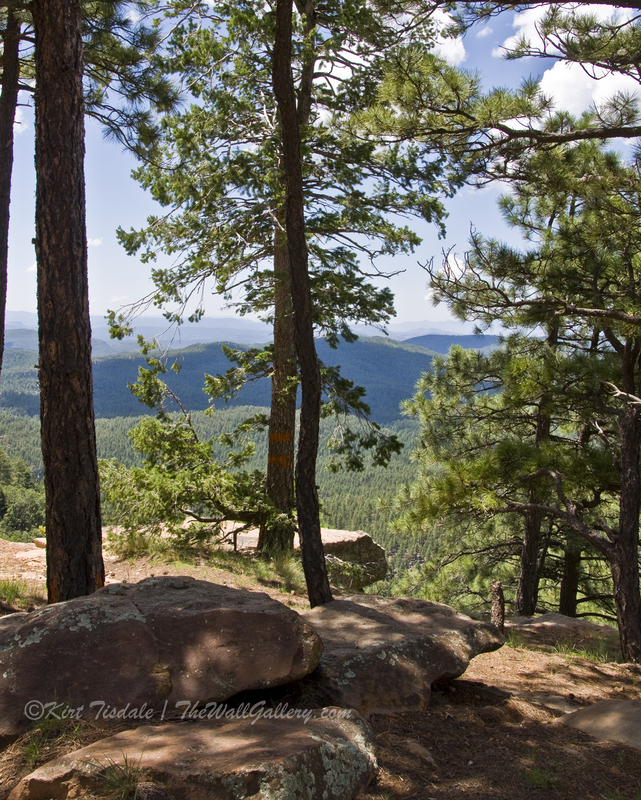 The second shot is from our picnic table looking through the trees towards the ledge in picture 1. So, this week, I’m just sharing some shots from my weekend, no words of wisdom or incredible insights….just enjoy the scenery! 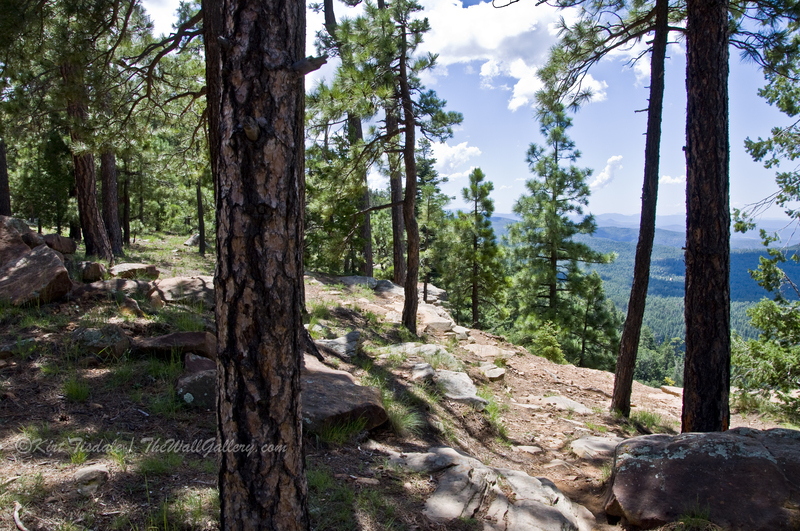 This entry was posted in Color Photography and tagged arizona, art prints, forest, kirt tisdale, mountains, online art gallery, photographer, photography, pine trees, trees on August 20, 2014 by Kirt D Tisdale. The art print I wanted to feature today is from my Street Scenes/People Collection titled “Village Shops”. 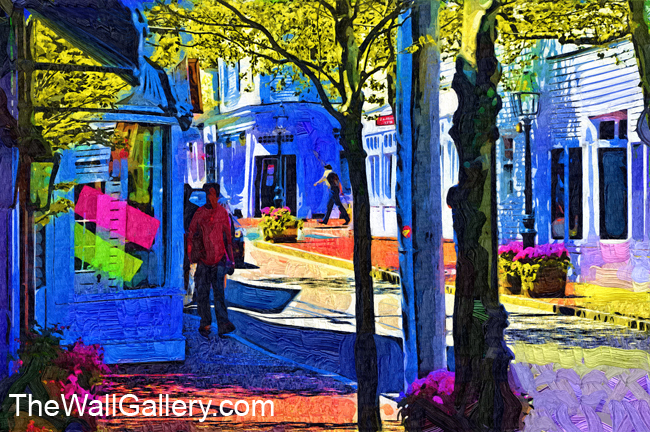 The print is of a New England village street with shops lining the sidewalk. I used a fauvism oil technique to create this abstract and brightly colored rendition of this typical New England setting. I love the look of old New England villages with their streets lined with shops and cafes. The roads are narrow and the architecture quaint and inviting. Since I am always trying to capture a moment that will speak to a viewer, I like the aspect of this setting. We have just enough street and buildings to create the overall scene. The other elements to finish the look are the trees, lampposts and of course, people. I love the bright colors and abstract painting as it creates an upbeat feel to the print and doesn’t get lost in the detail, but has enough that the look makes sense. I invite you to come into the gallery to view the collection of Street Scenes/People. 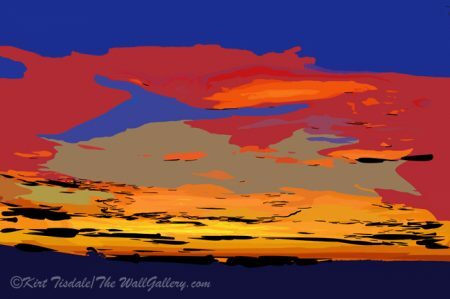 This entry was posted in Abstract Oil, Art Prints and tagged abstract art prints, artist kirt tisdale, contemporary artist, interior design, new england, new england villages, online art gallery, Visual Arts on August 15, 2014 by Kirt D Tisdale.